Photograph Showcase: Which Grandfather Hyde? Before you look at the next photo or read my post, please guess the age of this man. This is one of several photos in my collection that is puzzling. I believe I have worked it out. Let me tell you what I think and then how about you tell me if I convinced you? Deal? Okay, here goes. This photo was found amongst a batch of photos belonging to Vera Duval. Vera is the daughter of Francis Cyprien Duval & Alice Hyde and the sister of my great-grandpa Frank Duval. The back of the photo, shown here, was written on at two very different dates by two different people. The first thing that was written was: To Arthur & Alice. That handwriting is not familiar but seems have been written at or near the time the photo was taken. 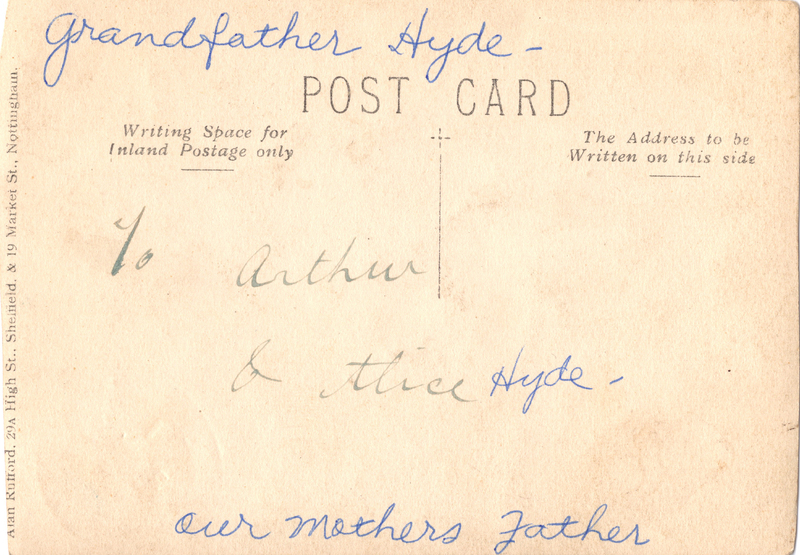 The second thing that was written was: Grandfather Hyde – then the writer added the last name Hyde next to Alice’s name – Our Mothers Father. I believe the second writer is Vera. The handwriting is consistent with her handwriting and the photo is from her collection. 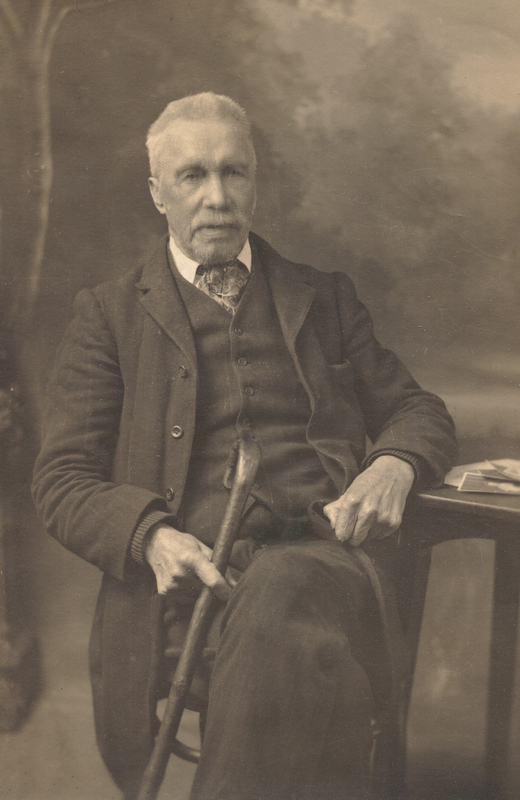 If I am correct that Vera wrote ‘Our Mothers Father’, then that would mean that this is a photo of Alice Hyde’s father Henry Hyde. Simple, right? No. This is where we run into a problem. Henry Hyde was born in Sheffield, Yorkshire, England in 1852. He married Ann Whiteley in Pitsmoor, Yorkshire, England in 1873. The next event of record is the birth of their daughter Alice in 1880 in Ontario, Canada. In 1884, Ann dies during childbirth in Golden, British Columbia, Canada. After Ann’s death Henry sends their daughter Rosie (possibly the daughter born in 1884) back to England to live with his parents. In January of 1885 Henry marries Ann’s younger sister Alice in York, York, England. Then they leave England and move to Alaska. I know that they are living in Fairbanks, Alaska in 1896. I know that Henry dies in 1908 in Fairbanks. Based on the family stories, I believe that Henry did not leave Alaska again after 1896. After Henry’s death, Alice marries Henry’s brother Arthur in Alaska. Arthur & Alice. The only Arthur & Alice the photo could have been given to. All of this leads me to the important question – Which Grandfather Hyde is this? Is this a photo of Henry Hyde who died in Alaska or his father Henry Hyde who lived his entire life in York County, England. Alaskan Henry or English Henry? Henry was 56 years old at the time of his death. I’m not great with ages but I think the man in the photo is a fair bit older than 56. This photo was taken in Sheffield, York, England. If it were Alaskan Henry then it would likely have been taken prior to 1896 making Henry 34 or younger. No way is that guy up there 34 or younger. But that is not even possible anyway because of the photographer. The photographer, Alan Rufford, is listed in the Sheffield, York, England city directories in 1908 & 1911 but not in 1905. This leads me to believe the photo was taken between 1905 and 1911 or possibly later. Alan could have opened up his shop after the printing of the 1905 directory. The Sheffield Indexers have a spreadsheet of photographers in Sheffield with the dates they were in business based on the city directories. They have Alan Rufford listed only in 1908 & 1911. So far that is all I have found as well. Because Alaskan Henry died in 1908 I have a feeling he didn’t make a quick trip to Sheffield for a photo just before he died. Would Alaskan Henry have inscribed a photo of himself to his wife and brother? Kind of weird. I hope not. English Henry was born in about 1831 in Sheffield, York, England. I don’t know his death date. He is still living at the time of the 1901 England Census. I haven’t found him in 1911. If the photo was taken sometime between 1905 and 1911, English Henry would have been 74-80 years old. Like I said, I’m not great with ages, but that seems like a better match to me. The photo is inscribed to Arthur & Alice. Arthur is English Henry’s son. English Henry presumably knew Alice. After Alaskan Henry’s death maybe English Henry had this photo taken and sent it to his son and double daughter-in-law in Alaska? This photo was taken in England. English Henry was certainly in England and it is more likely he would have been photographed there during this time period than his son who did not live in England. What do you think? Did I convince you? Am I completely wrong? Which Grandfather Hyde do you think this is? English Henry or Alaskan Henry? He defintley looks to be a man in his 70s. I think he is Henry born c1831. Seems he was living at 56 Boleshill Lane, Sheffield in 1911 with his married son Louis/Lewis. This comes under Eccleshall Bierlow district and there is a death for a Henry Hyde in that district in 1917 that fits with a birth year of c1831. Thanks Alex for the validation! 🙂 You are awesome to do a little digging for me. I’m mildly embarrassed to admit that I hadn’t even looked yet… But then again, no one has time for everything. One step at a time. But now I have to go look for those Items you suggested. You totally altered the course of my morning, in a good way! You’re welcome! Thought I would have a quick look! I really appreciate your time and interest. This is a line that is not very straightforward and I have been hesitant to do much research. Young Henry isn’t on the census with his family in 1861 or 1871. The family records I have match the family I find on the census except for the fact that young Henry isn’t with them. I know that isn’t a deal breaker as he could have been living/staying elsewhere, but I have been trying to learn everything I can about Henry before I chase his parents and siblings. I want to make sure I don’t research the wrong family. I did recently find some interesting items about Arthur and Rosie that are tying a few things together. I suppose I’m just being overly cautious. I know what you mean. I’ve gotten ahead if myself before! Having seen Rosie in the household with Henry senior and his other children like Arthur and Lewis/Louis did seem to tie it up, plus the 1891 entry also came under the Eccleshall Bierlow district. Yes, Rosie on that 1891 census is one of the things I’m liking. I could not find that 1911 census you mentioned. I tried all kinds of things. So then I called a friend who has a findmypast subscription and used hers and it came right up. I took the additional info about Esther Elizabeth and tried several more searches and still can’t find it on ancestry. Weird and frustrating! Any thoughts on why Henry (William Henry Hyde(s), born 25 January 1852 in Sheffield) isn’t on the census with his family in 1861 or 1871? I can’t find him anywhere. Of course that is using ancestry, maybe I need to try findmypast. It does seem odd that he isn’t anywhere to be found in 1861 or 1871. I did notice that his parents Henry and Sarah had his grandmother Ann Hyde(s) with them in 1881. I can’t seem to locate her in 1861 either so it might be that he was with her somewhere. The first one being the service record – most pages refer to him as William Henry Hydes but the third page he gives himself as just Henry Hydes. I couldn’t see any details for next of kin but he joined up in 1869 and seems to have been discharged in 1872 due to disability – which looks like Dementia but this seems odd for a young man who was only about 17 when he joined up. He notes he had a tattoo with the letters W H H on one of his arms. I have saved the images so I can email them to you. The second entry is a line for him in the Chelsea Pensioners Discharge Book – which I have saved too. The records show he was a Carter when he signed up and also shows he may have been illiterate as he signed his name with an x. Did you have the record of his marriage to Alice? Wow! I’ll have to be careful what questions I ask you in the future because you really go above and beyond!! I have the indexed information on Henry and Alice’s marriage, I haven’t ordered the certificate yet. I saw that you sent me an email with the documents. Thank you Alex. I’ll go through it late today and respond probably while you are busy snoozing away. Thanks again! I do like a bit of a puzzle! Found it! Last name was indexed as ‘Hyle’ on ancestry. Made it tricky to find. I would also go with English Henry. There is something about the mouth, the way it is hanging slightly open that reminds me of an older, more elderly man. Those post cards are hard to date but I think it could be as early as 1900, although I see the photographer wasn’t advertising in the directory at that point. Thanks for the input Deborah! I agree, English Henry. Just looking at the face and hands, is enough to tell he’s older. I didn’t go check anything but based on the above comments I think you’re pretty solid on your guess. Thanks for the vote of confidence and thanks for stopping by!